Iupot.com is the PUP that uses misleading techniques to prevent removal. Use Reimage to locate malicious components and get rid of them faster than with uninstall instructions. A full system scan blocks virus reappearance and prevents traffic to malicious domains. Iupot.com is a potentially unwanted program (PUP) that redirects users to various suspicious websites that might be used for phishing and swindling money from gullible people. The adware is unpredictable, and you may encounter redirects anytime while surfing the web. Even if it may seem just merely annoying, it increases the risk of getting infected with other malicious programs and disrupting your system. The developers of this potentially unwanted application falsely represent it as a useful “helper object” bundled together with free software. 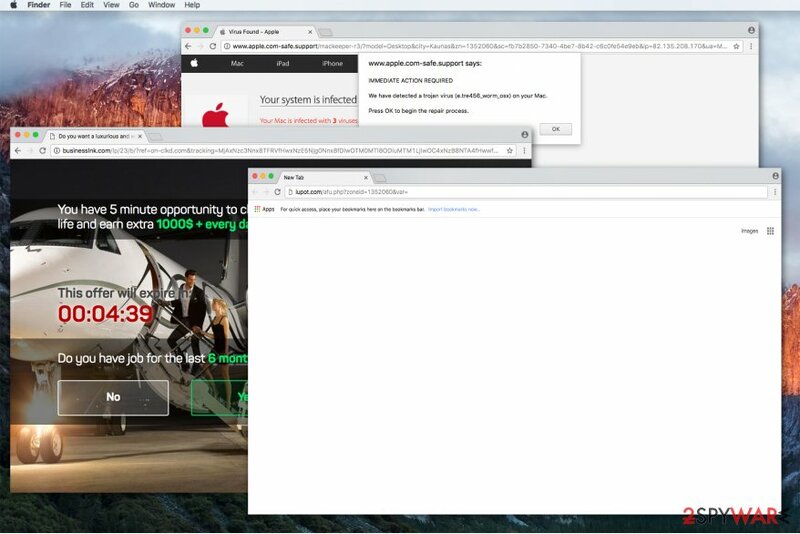 People do not pay attention while installing apps and as a result, unconsciously set up adware onto their computers, which later stealthily alters browser settings and causes a never-ending stream of ads. Ads might appear as pop-ups, banners, free coupons or even false security alarms — created to generate revenue by clicks for its developers. Be aware that Iupot developers are not responsible for the content of the ads they promote; thus even accidental clicks on the sponsored advertisements might trigger an automatic installation of high-risk computer infections. 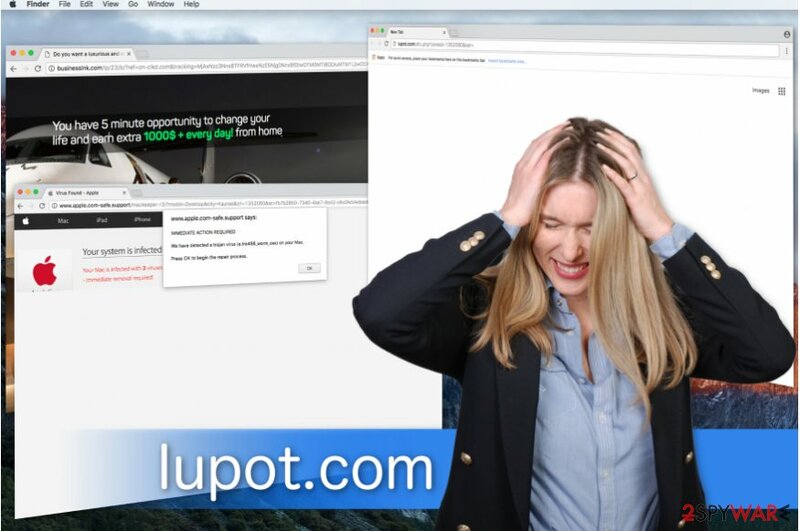 We recommend you to avoid clicking on promoted ads and remove Iupot.com immediately. Besides, adware collects various browsing-related information that might be used to display advertisements which correspond to your interests and increase the possibility that you will click on them. If that is not enough, the gathered information may be personally identifiable and lead to serious privacy issues or even identity theft. Moreover, do not get tricked by the false security alarms generated by the potentially unwanted program (PUP). They are only used to intimidate you and rush to purchase expensive security software or give remote access to your computer. We want to assure you that your computer is safe. But it is one of the critical factors that warns you about the adware installed on your device. If you noticed that your computer behaves similarly as mentioned above, you should immediately scan your system using Reimage or any other reputable security software and start an Iupot.com removal. Iupot.com virus is an annoying computer program that loads third-party advertisements via the indicated domain. These ads are considered to be untrustworthy, so users should never interact with them. The potentially unwanted programs (PUPs) are hidden inside free software installer. Typically, it is pre-selected to download it together with the regular program if you choose Quick/Recommended installation. Thus, people who are in a rush, are not able to unmark the ticked boxes providing their permission to install the adware. To avoid the infiltration of the PUP on your system, you should always opt for the Advanced or Custom installation process and never agree to download unauthorized applications or scan them using a reputable anti-spyware program of your choice. Moreover, you should avoid clicking on sponsored ads since they might redirect you to suspicious websites used to distribute malware. Even though they look attractive, remember that in reality they are designed to increase click-generated revenue for its developers. To remove Iupot.com and free yourself from continuous redirects, you should choose a reliable anti-spyware application and download it from verified developers. Shortly after, you will be able to run a full system scan and eliminate the potentially unwanted program (PUP). While other people might prefer to perform a manual Iupot.com removal, we want to warn you that it may become a challenge. You will have to detect all suspicious applications and carefully remove them. Else way, it might lead doing more harm than good. To make things easier for you, Lesvirus.fr IT specialists have prepared detailed instructions provided below. Carefully follow the steps and adequately get rid of the adware. To detect the cause of annoying Iupot.com redirects, use the guide provided below. It explains where to find unwanted files associated with the adware that's causing these interruptions during your browsing sessions. Here, look for Iupot.com or any other recently installed suspicious programs. Wait until you see Applications folder and look for Iupot.com or any other suspicious programs on it. Now right click on every of such entries and select Move to Trash. When in the new window, check Delete personal settings and select Reset again to complete Iupot.com removal. Once these steps are finished, Iupot.com should be removed from your Microsoft Edge browser. Refresh Firefox using experts tips provided below. Here, select Iupot.com and other questionable plugins. Click Remove to delete these entries. Now you will see Reset Firefox to its default state message with Reset Firefox button. Click this button for several times and complete Iupot.com removal. Although the easiest way to fix Chrome is to reset it, you can go extra and visit chrome://extensions page to delete suspicious extensions from there. Then check what URL is inserted into startup settings using the guide given below. Here, select Iupot.com and other malicious plugins and select trash icon to delete these entries. Click Reset to confirm this action and complete Iupot.com removal. Here, select Extensions and look for Iupot.com or other suspicious entries. Click on the Uninstall button to get rid each of them. Here, look at the Homepage field. If it was altered by Iupot.com, remove unwanted link and enter the one that you want to use for your searches. Remember to include the "http://" before typing in the address of the page. Now you will see a detailed dialog window filled with reset options. All of those options are usually checked, but you can specify which of them you want to reset. Click the Reset button to complete Iupot.com removal process. ^ What is Targeted Marketing?. Marketing Schools. All things Marketing. ^ Richard Stokes. Ultimate Guide to Pay-Per-Click Advertising. Google Books. The World's Most Comprehensive Index of Full-Text Books. ^ LesVirus. LesVirus. Spyware and Malware Removal Tutorials. This entry was posted on 2017-10-30 at 08:35 and is filed under Adware, Viruses. You can quickly scan the QR code with your mobile device and have Iupot.com virus manual removal instructions right in your pocket. How did you remove Iupot.com virus?